NRV series rotary vane type hydraulic steering gear is designed following to the integration concept of steering mechanism, electro-hydraulic pump unit, steering control and alarming system, and is able to satisfy the requirements of different vessels. A serial of stringent control in aspects of structural designing, material selection, machining precision and final commissioning makes the manipulation of steering gear more stable, flexible and reliable. 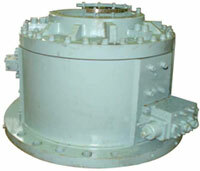 The vessels installed iwht NRV series steering gear can transit the narrow channel easily and be in shore more safely. �� Friendly to operate and maintain. ?Nanjing High Accurate Marine Equipment Co.,Ltd.